Looking to speed up your cash flow with a Next Day Funding Merchant Account? You’ve come to the right place. Don’t wait 3-5 days to receive YOUR money! Get YOUR money faster. We can help you. We have relationships with processing banks that offer Next Day Funding merchant services for retail and restaurant merchants; including American Express. Next day funding for AMEX? Yes! This is a very unique product that most processors cannot offer. We take great pride in listening to our customers and providing solutions. In response to numerous inquiries for Next Day Funding at Interchange Plus Rates, we introduced Next Day Funding Merchant Accounts in 2010. Now this is our most popular merchant services product for retail and restaurant merchants. When comparing credit card processors, be sure to not only ask them about funds availability but also ask them to disclose all possible fees. There can be big differences here. Our partner for next day funding accounts does have a mandatory PCI Compliance fee ($99.00 per year charged in August of each year) like most processors but does not have an annual fee requirement and will agree to month-to-month contracts with no long-term commitments. By the way, these accounts do NOT have TIN/TFN fees at this time. These merchants accounts are priced at TRUE interchange and we can show you the difference. As an experienced payment consultant with an unmatched portfolio of leading processing bank partners and access to nearly any payment product in the industry, we are proud to be part of the elite list of independent bankcard agents that offer this faster funding merchant account. Get your money faster. Get your money quicker. Get next day funding. There is no reason to let banks and processors hold your money. 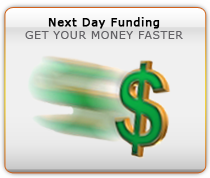 Get faster deposits with a Next Day Funding Merchant Account. Apply online now. For clients with approved accounts, the Merchant Services Customer Support is available 24/7/365 for both technical/terminal support and customer support. In order to receive funds the next day, merchants must batch out by 7:00pm EST (auto batch can be set up for 6:30pm EST in order to meet criteria).